When and where will the auction be held? The auction was on Friday March 22, 2019 at the Tompkins Center in Grosse Pointe Park’s Windmill Pointe Park. Stay tuned for 2020 auction details. Why do we have an auction? For our children’s education! This is our largest fundraiser each year. The funds we raise through the auction help us preserve our exceptional educational experience while maintaining an affordable tuition. Who attends the auction? We encourage all families to attend and bring guests! Extended family and friends are all welcome. This night is a celebration of great friendship, great food, great finds, and great fun! What happens the night of the auction? Come prepared to eat, drink, be merry, and bid! While bidding is appreciated, it is not required. Silent auction: At 7:00 pm you can preview and bid on the many items in the silent auction. Promptly at 8:30 pm the silent auction closes so be sure to keep tabs on any bids you’ve made! Bids go up in increments of $5. There are many great bargains to be had! There are sports, theater, and museum tickets, salon and spa services, children’s items, restaurant certificates, and so much more. There is truly something for everyone! During this time you can also participate in our raffles for a chance to win a cash prize or a weekend getaway. Around 9 pm fabulous and entertaining auctioneer, Dan Jenuwine will begin the live auction. This fast-paced portion of the evening is so much fun! 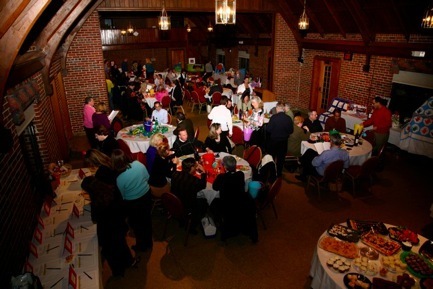 The live auction is filled with many tempting items such as event tickets, lawn care packages, jewelry, children’s birthday party packages, your child’s amazing class art projects, and again, so much more. As with the silent auction, there is something for everyone! However, not everyone will bid and not all bidders will win. How does the preschool acquire the auction items? The auction committee has an acquisitions team which is responsible for contacting local businesses in hopes of securing donations. We are very fortunate to live in a community where so many individuals are willing to donate their time, money, goods, and services. Although our auction committee is committed and fabulous, the success of our auction depends on all of our families. Each and every preschool family contributes by donating, sponsoring, or soliciting at least one item or package worth a minimum value of $25. If you have something you would to donate or would like an invitation to attend please contact Rebecca Gibson. 4 Walt Disney World park hopper tickets , Detroit Princess Riverboat Cruise .Themed gift baskets . Jewelry . A Personal visit from Santa . One of a kind art work created by each of the classes . An assortment of children birthday parties, including Jungle Java, Extreme Gymnastics, The Rink and others. Many, many more fabulous items available. Don’t miss out on the fun!